But these reactions do not address what the study actually says. It acknowledges the raw numbers but says that the apparent overrepresentation is really a product of minorities' greater exposure to risk factors such as low birthweight. After taking these other factors into account, the study finds that minorities are underrepresented compared with similarly-situated white students. There may be problems with the data or the statistical analysis, but simply pointing to the raw numbers is beside the point. The Senate reaffirmed the bill striking California's personal belief exemption for immunizations on a 24-14 vote. Mississippi and West Virginia are the only two states with such strict requirements in place. "The governor believes that vaccinations are profoundly important and a major public health benefit, and any bill that reaches his desk will be closely considered," governor's spokesman Evan Westrup has repeated in recent days. Democratic Sens. Richard Pan of Sacramento and Ben Allen of Santa Monica introduced the measure after an outbreak of measles at Disneyland in December infected over 100 people in the U.S. and Mexico. "The science remains unequivocal that vaccines are safe, that vaccines save lives," Pan said. When Matt Crockett's 2-year-old son Mark was diagnosed with autism, the Air Force Reserve technician assumed his government insurance would help cover the cost of the treatment. He discovered the Federal Employee Health Benefits Program (FEHBP) encourages — but does not require — insurance carriers to cover the cost of the leading treatment for autism. In fact, only 23 states offer federal health insurance plans that cover Applied Behavior Analysis (ABA) therapy, which leaves federal employees trapped in a patchwork of coverage that costs tens of thousands of dollars a year. Federal employees can receive coverage for ABA therapy if they live in certain states. Crockett, however, lives in Washington state and cannot get an FEHBP plan that covers it. "The general limitation of the available studies is that they haven't been able to correct for minority children's unfortunate, but well-established, greater risk factor exposure to factors that themselves increase the risk for disability," said Morgan. "For example, minority children in the U.S. are much more likely to be born with low birth weight than children who are white, as well as more likely to be exposed to lead in their environment." Adjusting for this greater risk factor exposure indicated that children who are racial, ethnic or language minorities in U.S. elementary and middle school are instead less likely to receive special education help than otherwise similar white, English-speaking children, according to the researchers, who report their findings in the current issue of Educational Researcher. The magnitude of these differences is large. For example, according to the dataset analyzed by the researchers, the odds of black children being identified as learning disabled are 58 percent lower than white children displaying the same levels of academic achievement, behavior and family economic resources. Black children are 57 percent less likely to be identified as having intellectual impairments and 77 percent less likely to be identified as having health impairments compared to white children. The odds that black children are identified as having emotional disturbances are also 64 percent lower than otherwise similar white children. The odds that Hispanic children would be identified as having learning disabilities are 27 percent lower than otherwise similar white English-speaking children. Hispanic children are also 33 percent less likely to be identified as having speech or language impairments and 73 percent less likely to be identified as having health impairments. These numbers differ significantly from the unadjusted or minimally adjusted comparisons. For example, black children make up approximately 14 percent of the general school age population, yet are about 19 percent of the special education population. "Prior studies have often relied on 'apples to oranges' comparisons between minority and non-minority children, who likely differ in ways other than their race, ethnicity, or language use," said Morgan. "Yet characterizations have been repeatedly made of the special education system as racially biased based on these 'apples to oranges' studies." Federal law and policies require states to monitor and report on the extent of overrepresentation of minorities in special education. School districts are required to take corrective action if overrepresentation is reported. Morgan said these federal efforts, although well intentioned, could actually exacerbate inequities in access to special education and related services. "What's happening is that federal officials have been monitoring and, to some extent, flagging racial bias when they observe what they view as minorities being overrepresented in special education, yet, what is occurring is that minorities are underrepresented in special education," said Morgan. "Instead of emphasizing prevention or reduction of minority overrepresentation, cultural or language barriers may be making it less likely for minority children with disabilities to be appropriately identified and treated." The researchers failed to observe any tendency of U.S. schools to be racially biased toward identifying minorities as disabled and, therefore, inappropriately placing these children into special education classrooms. Instead, the results indicated that white, English-speaking children are systematically more likely to be provided with special education services. The researchers suggest that training could help educational professionals better identify minority children with special needs. The state Assembly passed a closely watched bill Thursday compelling school children to be fully vaccinated, approving the measure on a 46-30 vote that blurred party lines. Perhaps no bill this year has fomented the same level of passion as Senate Bill 277, which would erase the broad personal belief exemption that allows California parents to enroll children who have not received the entire range of recommended shots. Proponents argue it would protect public health by shoring up a key bulwark against the spread of disease, while its critics say it removes parents’ ability to decide which vaccines their children receive. Assemblyman Mike Gatto (D-Glendale) opposed the bill, telling his colleagues before the vote that it violated the rights of parents to decide medical treatment for their children. "The broadness of this bill likely dooms it from a constitutional standpoint" Gatto said, accusing the state of "infringing on the rights of children to attend school." Supporters said it was necessary to protect all children. "I'm a fierce supporter of parent choice in this decision. But I also believe with choice comes personal responsibility" said Republican Assemblywoman Catharine Baker of San Ramon. 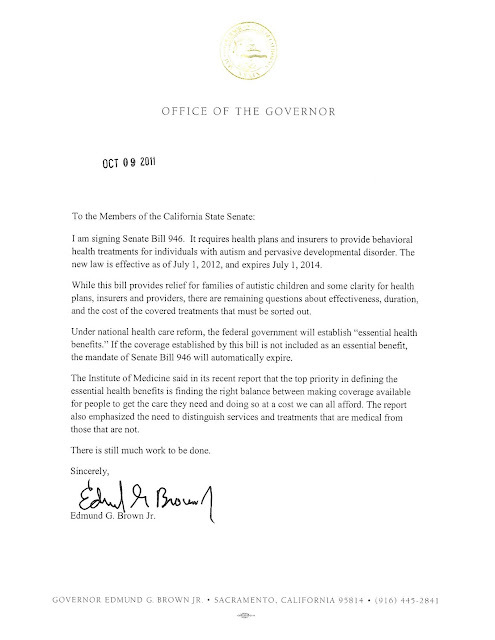 The governor's staff has said Brown "believes that vaccinations are profoundly important and a major public health benefit and any bill that reaches his desk will be closely considered." But it's unknown whether or not Brown would allow the religious exemption to be dropped from the current bill. In 2012, then-assemblyman Pan helped pass a bill aimed at tightening the state's vaccine law by requiring parents who wanted to exempt their children from the shots meet with a healthcare professional. The state Assembly is expected to vote Thursday on SB 277, the controversial bill that would require all children to be vaccinated in order to attend daycare or school. The bill would eliminate the personal belief and religious exemptions to vaccination, while maintaining the medical exemption. Ahead of that vote, there's been a flurry of last-minute politicking by the bill's opponents and supporters. A group calling itself the Public Health Council paid for anti-SB 277 robo calls. In the automated message, a woman claiming to be a mother says the bill would "take away our right to make important medical decisions for our children." She urges people to call their assemblymember and tell him or her to vote "no" on SB 277. A Voice for Choice placed four advertisements in the Sacramento Bee this week. The ads look like political cartoons and show the supposed consequence of the bill becoming law: One depicts the tombstones of children who allegedly died of so-called "lethal vaccination." Carl Krawitt delivered a message Wednesday for opponents of a deeply divisive bill that would mandate vaccinations for all school children, regardless of their parents' personal or religious beliefs. "Get a real problem," said Krawitt, the father of a 7-year-old leukemia survivor from Corte Madera who couldn't be fully vaccinated until he completed chemotherapy and beat cancer. "I know what fear is because I was in the hospital with a kid whose odds of survival were pretty low," Krawitt said Wednesday at a Sacramento news conference. "But what scared me more than the threat of disease was the misinformation" about vaccines. Krawitt visited the Capitol with his son, Rhett, to give Gov. Jerry Brown a copy of a petition signed by 32,000 supporters of SB277, which will face another tough vote Thursday on the state Assembly floor. The Senate has already approved the bill. A split among African American leaders on the issue of government-required vaccination has roiled the Capitol as lawmakers consider whether to eliminate most exemptions to state immunization laws. “That is a traitorous act,” he said of black lawmakers voting for the bill, which already passed the state Senate. “They will not be welcome in the black community if they vote like that. Echoing vaccine critic Robert F. Kennedy Jr., and using forums owned by the Church of Scientology, among other platforms, the head of the Nation of Islam and the group’s Los Angeles leader have spent the last several weeks denouncing the measure, which would eliminate the state’s overly broad “personal belief” exemption to school vaccination. Last week, the Rev. Louis Farrakhan urged black families in Los Angeles to keep their kids home from school if state lawmakers pass SB 277, citing discredited claims that vaccines are linked to autism, particularly among black male children. Meanwhile, Nation of Islam Western Regional Minister Tony Muhammad, who has credited Scientology with his emotional recovery after a police beating, appeared with Kennedy at a “town hall” at the church’s South Los Angeles community center. Kennedy claimed that the pharmaceutical industry has corrupted the Centers for Disease Control and Prevention and Muhammad called out legislative Black Caucus members by name who had voted for SB 277. Guardianship is a complicated legal concept, which is further complicated by differences from state to state in the framing and implementation of distinctly different forms. Few professionals explain the long-term consequences of obtaining guardianship or provide the range of alternatives available to support an adult with disabilities. This study reports descriptive data from a national survey on guardianship and people with disabilities. The results indicate that regardless of who provides information about guardianship, and regardless of disability classification, full guardianship is consistently discussed most frequently while other options are rarely discussed. We describe implications for practice and provide recommendations. Specifically, supported decision making is described as one potential alternative to legal guardianship that, according to these data, is the least frequently discussed with parents, but which has the potential to avoid many of the legal and social pitfalls that guardianship presents. Limitations and current research needs are described. There are different ways to look at the correlation between disease and personal-belief exemptions. Researchers, including Jessica Atwell, a doctoral student studying global disease, epidemiology and control at Johns Hopkins University, say county data is too broad. That rebuts testimony at an assembly hearing last week by Melissa Floyd, a member of California Coalition for Health Choice, which opposes SB277. Floyd told lawmakers there’s no correlation between the prevalence of disease and number of personal-belief exemptions in a county. When pertussis came roaring back in 2010 in California, infecting more than 9,000 people and killing 10 infants too young to be vaccinated, the highest rate of disease was in Marin County, where 7.1 percent of children had personal-belief exemptions. Nevada County had the highest percentage of personal-belief exemptions that year at 18.9 percent but its case rate was dramatically lower, according to data from the California Department of Public Health. But a 2013 study Atwell co-authored in the Journal of Pediatrics mapped the location and timing of outbreak clusters and compared that to the location and number of whooping cough cases with personal-belief exemptions. The study found people who lived in areas with high rates of personal-belief exemptions were 2.5 times more likely to live in a place with a lot of whooping cough cases. The law would also pass the First Amendment test due to a 1905 United States Supreme Court ruling that has been repeatedly upheld. In that case, a man refused to get a mandated Small Pox vaccine, not wanting to pay the required five dollars. While the case was not about religion, the Supreme Court noted that the “liberty secured by the Constitution of the United States does not import an absolute right in each person to be at all times, and in all circumstances, wholly freed from restraint, nor is it an element in such liberty that one person, or a minority of persons residing in any community and enjoying the benefits of its local government, should have power to dominate the majority when supported in their action by the authority of the State.” They concluded that it was in the power of the state to enact a compulsory vaccination program. We prospectively examined evidence for the sustained effects of early intervention based on a follow-up study of 39 children with ASD who began participation in a randomized clinical trial testing the effectiveness of the Early Start Denver Model (ESDM) at age 18 to 30 months. The intervention, conducted at a high level of intensity in-home for 2 years, showed evidence of efficacy immediately posttreatment. This group of children was assessed at age 6 years, 2 years after the intervention ended, across multiple domains of functioning by clinicians naive to previous intervention group status. The ESDM group, on average, maintained gains made in early intervention during the 2-year follow-up period in overall intellectual ability, adaptive behavior, symptom severity, and challenging behavior. No group differences in core autism symptoms were found immediately posttreatment; however, 2 years later, the ESDM group demonstrated improved core autism symptoms and adaptive behavior as compared with the community-intervention-as-usual (COM) group. The 2 groups were not significantly different in terms of intellectual functioning at age 6 years. Both groups received equivalent intervention hours during the original study, but the ESDM group received fewer hours during the follow-up period. These results provide evidence that gains from early intensive intervention are maintained 2 years later. Notably, core autism symptoms improved in the ESDM group over the follow-up period relative to the COM group. This improvement occurred at the same time that the ESDM group received significantly fewer services. This is the first study to examine the role of early ESDM behavioral intervention initiated at less than 30 months of age in altering the longer-term developmental course of autism. This study expands previous equine-assisted intervention research by evaluating the effectiveness of therapeutic horseback riding (THR) on self-regulation, socialization, communication, adaptive, and motor behaviors in children with autism spectrum disorder (ASD). Participants with ASD (aged 6–16 years; N = 127) were stratified by nonverbal IQ standard scores (≤85 or >85) and randomized to 1 of 2 groups for 10 weeks: THR intervention or a barn activity (BA) control group without horses that used similar methods. The fidelity of the THR intervention was monitored. Participants were evaluated within 1 month pre- and postintervention by raters blinded to intervention conditions and unblinded caregiver questionnaires. During the intervention, caregivers rated participants’ behaviors weekly. Intent-to-treat analysis conducted on the 116 participants who completed a baseline assessment (THR n = 58; BA control n = 58) revealed significant improvements in the THR group compared to the control on measures of irritability (primary outcome) (p = .02; effect size [ES] = 0.50) and hyperactivity (p = .01; ES = 0.53), beginning by week 5 of the intervention. Significant improvements in the THR group were also observed on a measure of social cognition (p = .05; ES = 0.41) and social communication (p = .003; ES = 0.63), along with the total number of words (p = .01; ES = 0.54) and new words (p = .01; ES = 0.54) spoken during a standardized language sample. Sensitivity analyses adjusting for age, IQ, and per protocol analyses produced consistent results. This is the first large-scale, randomized, controlled trial demonstrating efficacy of THR for the ASD population, and findings are consistent with previous equine-assisted intervention studies. Trial of Therapeutic Horseback Riding in Children and Adolescents With Autism Spectrum Disorder;http://clinicaltrials.gov; NCT02301195. This research aims to describe the characteristics of 1915(c) Home- and Community-Based Services waivers for children with autism spectrum disorder across states and over time. While increasingly popular, little is known about these Medicaid waivers. Understanding the characteristics of these programs is important to clinicians and policymakers in designing programs to meet the needs of this vulnerable population and to set the stage for evaluating changes that occur with the implementation of health-care reform. Home- and Community-Based Services waiver applications that included children with autism spectrum disorder as a target population were collected from the Centers for Medicare and Medicaid Services website, state websites, and state administrators. A data extraction tool was used to document waiver inclusions and restrictions, estimated service provision and institutional costs, and the inclusion of four core autism spectrum disorder services: respite, caregiver support and training, personal care, and evidence-based treatments. Investigators identified 50 current or former waivers across 29 states that explicitly included children with autism spectrum disorder in their target populations. Waivers differed substantially across states in the type and breadth of autism spectrum disorder coverage provided. Specifically, waivers varied in the populations they targeted, estimated cost of services, cost control methods employed, and services offered to children with autism spectrum disorder. Home- and Community-Based Services waivers for children with autism spectrum disorder are very complex and are not consistent across states or over time. Further efforts are needed to examine the characteristics of programs that are associated with improved access to care and clinical outcomes to maximize the benefits to individuals with autism spectrum disorder and their families. When a doctor told Susan Levin her 4-year-old son, Ben, was autistic, she was shocked. It was October 2007, and autism wasn’t mentioned in the media nearly as much as it is today. Levin doesn’t call this particular cure a silver bullet for autism: There is no silver bullet, no one-size-fits-all approach. Rather, she credits his transformation to a number of things, including a home based and child centered social-relational program called the Son-Rise Program. There does appear to be room for larger rigorous trials [of dietary interventions], but over 40 years of research has failed to find any signal in this data. It is also possible, as some of the authors note, that children with autism might also incidentally have food allergies or insensitivities, and removing this food will have a positive effect on their behavior simply because it is removing an irritant. There is no evidence to suggest, however, that gluten or casein is playing any causative or significant role in the etiology of autism itself. There is no diet that treats autism, let alone is a cure. If you’re interested, Paul Offit reviews diet and other fake cures for autism in his book, Autism’s False Prophets. He goes into more detail about the history of the gluten and casein-free diets for autism. Dawson and other journalists writing for the “Living” section of their newspapers should really just not write about science. In this case she failed to consult or listen to any experts on the topic, she relied upon misleading anecdotes and the pronouncements of gurus. She failed to properly reflect that state of the research, or mention the common caveats in interpreting these stories. In short, anyone reading her article would be significantly misled about the science. This is also a serious issue that directly affects peoples lives. Parents of children with autism face a daunting amount of misinformation. In this case they are being told that they need to put their child on a draconian and expensive diet, and will be made to feel guilty if they don’t. This is just magnifying the burden that raising a child with a developmental challenge can pose. This type of misinformation causes direct harm. Description: The Son-Rise Program was developed and trademarked by Barry and Samahria Lyte Kaufman decades ago. The program offers training sessions to parents and others on how to implement home-based programs for children with a wide range of disabilities. The program is based upon the Kaufmans’ own personal theories of learning and development. A central principle of the Son-Rise program is that parents must convey an attitude of “total acceptance” of their child including all of his/her behaviors. The training that the Kaufmans offer places emphasis not on the child’s skills, or behaviors, or challenges, but more on the parents and caregivers. Research Summary: There have been no scientific studies of Son-Rise for individuals with autism spectrum disorders. Recommendations: Researchers may wish to conduct studies with strong scientific designs to evaluate Son-Rise. Professionals should present Son-Rise as untested and encourage families who are considering this intervention to evaluate it carefully. According to state statistics released in May by the Department of Health Care Services, 1,123 children have received behavioral health treatment services, which include ABA therapy as of May 5. That's just 2% of the estimated 76,000 children under age 21 who are enrolled in Medi-Cal and have autism spectrum disorder. State officials announced autism therapy as a Medi-Cal benefit on Sept. 15, 2014. The coverage is retroactive to July 7, 2014, when federal officials first issued guidance establishing autism therapy as a benefit. The remaining 16 counties provide behavioral services to 943 Medi-Cal managed care children, an average of roughly 59 children per county. Norman Williams, deputy director of public affairs for DHCS, gave California Healthline an updated estimate on June 10. 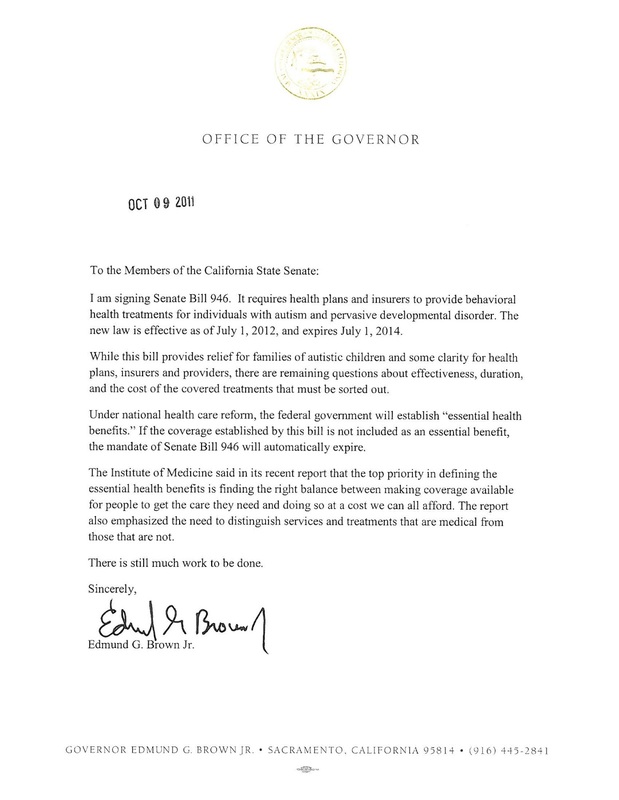 "Between 1,500 and 2,000 Medi-Cal managed care members are currently receiving BHT (behavioral health treatment) services, and we expect to have updated numbers soon," Williams said in an email message. "This does not include the approximately 9,000 members currently receiving services from regional centers. Medi-Cal managed care responsibility for BHT services for the majority of these members will occur later this year. The number of individuals accessing BHT services seem in line with other states based upon our discussions with them." Beyond the rates of coverage, there is another issue plaguing implementation of the autism therapy benefit, according to Kristin Jacobson, executive director of Autism Deserves Equal Coverage. She said the state is insisting on conducting a long diagnostic evaluation of children being considered for coverage. Trump is an advocate for the completely baseless theory that vaccines can cause autism. "I've seen people where they have a perfectly healthy child, and they go for the vaccinations, and a month later the child is no longer healthy," he said on Fox in 2012. "It happened to somebody that worked for me recently. I mean, they had this beautiful child, not a problem in the world. And all of a sudden, they go in, they get this monster shot. You ever see the size of it? It's like they're pumping in—you know, it's terrible, the amount. And they pump this into this little body. And then all of the sudden, the child is different a month later. And I strongly believe that's it." In light of the growing number of wandering-related deaths in the autism community, a group of national organizations have come together to support Senate Bill 163, Avonte’s Law. The group, the Autism Safety Coalition (ASC), announced today that its new social media campaign, “Yes to Avonte’s Law,” will also serve to educate the community and the public about the dangers of wandering behaviors in those with autism and other disabilities. Introduced by Senator Chuck Schumer (D-NY), Avonte’s Law Act of 2015 would help reduce the risk of injury and death relating to wandering behaviors in individuals with autism and other disabilities. “It would provide education, training, and resources to law enforcement agencies, first responders, schools, clinicians, and the public, “ says Lindsay Naeder of Autism Speaks. The law is named after Avonte Oquendo, a 14-year-old boy with autism who vanished from his New York City school in 2013. His body was discovered three months later in the East River. Wandering behaviors are considered common and short-lived in very young children, but may persist or re-emerge in individuals with cognitive disabilities. According to a 2012 study released by the journal Pediatrics, 49% of children with autism wander/elope from safe supervision. Twenty-nine percent of cases occur from a classroom or school. Tragically, cases involving a child with autism age 9 and younger have ended in death 42% of the time. Since the beginning of this month alone, six children with autism have died after wandering from a safe setting in Florida, New Hampshire, Texas, California and Illinois. “This is happening more than most people realize,” commented Tonia Ferguson of the Autism Society. To take action on Avonte’s Law or to learn more, visit autismsafetycoalition.org. The Politics of Autism discusses how the issue came up in the 2008 and 2012 campaigns. It is sure to come up in 2016, since Hillary Clinton has a long record on the issue, and Marco Rubio worked on autism legislation as a Florida legislator. Jeb Bush is launching his official candidacy with a video that features an autism mom. Berthy De La Rosa-Aponte (Cooper City, FL): Lucy has autism, she doesn't speak, she doesn't walk, but not being able to speak is not the same as not having anything to say. People with disabilities they want to have freedom, just like anybody else. He really cares about us. He really cares about people with developmental disabilities, and with all disabilities. There are people today that are getting services because of what Jeb did. He doesn't do it for himself, he does it because he is a true servant. He is the best voice that we can have. Gov. Bush: I am proud of the fact that many families now have the chance to live lives of purpose and meaning. You can improve the life of people, whether it's in the programs for the developmentally disabled, or changing our economy, or fixing our higher education system. All of these things can be fixed I am absolutely convinced of it. What we need is new leadership that takes conservative principles and applies them so that people can rise up. America's best days are in front of us, and we are going to lead the world. Some of the experts we spoke with said multiple lawsuits forced Bush to invest more money to serve more disabled Floridians, and the system was still left with many problems. Other advocates for people with disabilities -- including Democrats -- speak highly of Bush for meeting with families that often lack a political voice and for getting more money for community services. Bush inherited a troubled system with long waiting lists, which occurred before and after he was governor. Marcia Beach is an attorney who sued the state on behalf of people with disabilities, as well as a former Democratic Broward county commissioner. She said that overall, Bush’s record on this topic can fairly be called conservative as well. "I was always extremely grateful he was willing to put money into a program and make the necessary changes and advocate a shift in public policy from institutions to inclusion," she said. "If you think about the arguments it makes good sense. It really is a conservative philosophy if you can avoid higher costs in institutions, then you really get a better bang for your buck." But nothing’s lost. Or else: all is translation. The puzzle piece as a symbol for autism awareness, advocacy, and services is ubiquitous. Indeed, with the exception of the pink ribbon for breast cancer advocacy, we can think of no other image that is so clearly associated with a particular condition. The puzzle piece is now associated largely with the Autism Speaks Foundation and the Autism Society of America, but it was first used for autism advocacy in 1963 by the newly established National Autistic Society (NAS), an organization founded by parents and modeled on the Spastics Society of Children with Cerebral Palsy. The logo (no longer used by the NAS) was designed by Gerald Gasson, parent of an autistic child and member of the NAS board of directors. Gasson superimposed the image of a crying child on the puzzle piece to illustrate both that autism is a baffling condition and that people with autism suffer and do not “fit in” (Allison, 1987). In recent years, the puzzle piece has become a popular and hotly contested symbol in the media, in blogs, and in the world of philanthropy—the Autism Speaks Foundation has trademarked its own blue (perhaps male), anthropomorphized puzzle piece—and the passions the images elicit call out for comment. Autism: The International Journal of Research and Practice recently was asked to defend its use of a puzzle piece on the cover, and the resulting comments ranged from enthusiastically positive about the use of the puzzle piece to represent autism to vitriolic in their disdain for this symbol (http://the-art-of-autism.com/the-autism-puzzle-piece-a-symbol-of-what/). Why does the puzzle piece endure and why does it generate so much discussion and controversy? One way to begin answering this question is to think about autism spectrum disorder (ASD)—the phenomenon to which the puzzle refers—as an explanation for the confusion, and sometimes intense suffering, people experience as they struggle to relate, as individuals, to societies that are constantly changing shape. Certainly, the communities into which autistic individuals are born today are very different from the past, when so many people with autism were given unhelpful diagnoses such as childhood schizophrenia or mental retardation and were often institutionalized; when restricted interests and social and communication impairments were stigmatized, when mothers were blamed for their children’s problems, and when schools and employers could offer them few opportunities. While there is much more that must be done to support people with disabilities, the 21st century, particularly in North America and Europe, offers people with ASD unprecedented possibilities. Just as Merrill’s puzzle stands for the unstable relationship between the individual and the human condition in general, so too is ASD an ever-changing assemblage of ideas and practices that, perhaps like any historical construct, is a set of relationships “at once interlocking and in tension” (Williams, 1977). The meanings and values of “autism,” as we now conceive of it, like genetics or economics, or any other construction a society may use to explain human variation, change constantly because societies change. The U.S. incarcerates juveniles unequally and as a result, improvements have bypassed some of our children and youth. Youth from particular racial and ethnic backgrounds14 and youth with disabilities are incarcerated at disproportionately higher rates.15 Prevalence studies have found that 65-70 percent of youth in the justice system meet the criteria for a disability,16 a rate that is more than three times higher than that of the general population. Additionally, at least 75 percent of youth in the juvenile justice system have experienced traumatic victimization,17 leaving them at-risk for mental health disorders such as posttraumatic stress syndrome. A young man with autism received developmental disability services his entire life. On July 22, 2012, he had a behavioral episode during which he stabbed his stepfather. His stepfather was treated and released from the hospital the same night. The youth was seventeen and charged as an adult with attempted murder, but found not competent to stand trial. Later, the regional center pursued a commitment order to place him in a developmental center. The appointed public defender opposed the placement based on his strong ties to the community, his church, and family. The judge ordered the commitment, but did not allow placement at the developmental center and, instead, ordered the regional center to find and recommend a community placement. Meanwhile, when he turned 18 years old, he was transferred to a juvenile detention facility. The youth was housed in his own cell-block because, by law, he could not be around inmates under 18, and due to concern for his safety if housed in the adult facility. The P&A, Disability Rights California, advocated on his behalf and he was ultimately released from custody and placed in a community home. This is an example of a larger systemic issue involving the power of regional center staff to determine placement of certain youth, which the P&A is also addressing. "We wanted to help law enforcement and any first responders to realize that maybe this person is a little agitated because he falls within the autism spectrum disorder and to reflect and help this individual through the process,' said Jamey Durham, Director, Bureau of Professional and Support Services for the Alabama Department of Public Health. The state health department and the Autism Society of Alabama rolled out the Autism ID cards, helping both first responders and those who fall within the spectrum communicate. "The police, if I ever got in contact with any law enforcement it would help understand me better and treat me better,” said Willis. Durham says the cards were initially created for autistic drivers but the response has been so great, parents of autistic children want them. “We've had parents call and say listen, I have an autistic child and I would just like to have one of these cards so they can have it at school if something excites them, it would be nice to know they had that card in their purse or pocket that they could share,” he said. To obtain a card, print up the form at http://adph.org/disability take it to your diagnosing physician. After it's been filled out, verifying that you have been diagnosed with Autism Spectrum Disorder, take the signed form to any county health department to obtain a card. There is a $10 dollar fee. Children with autism spectrum disorder who are in Medi-Cal managed care plans are not getting the care they need, according to children's health advocates. A specific autism therapy -- applied behavior analysis, known as ABA therapy -- became a Medi-Cal benefit in September 2014. But according to figures released last month by the Department of Health Care Services, as of May 5, fewer than 1,123 children have received behavioral health treatment services, which include ABA therapy. An estimated 76,000 children under age two in the Medi-Cal program have autism spectrum disorder. "That's well under 2%," said Karen Fessel, executive director of the Autism Health Insurance Project. "It's frustrating that it's taking so long. Many [managed care plans] are not building a good faith network. Some have but most have not." The remaining 16 counties provide BHT services to 943 Medi-Cal managed care children, an average of roughly 59 children per county. Today, the Autistic Self Advocacy Network (ASAN), joined by over 60 disability advocacy organizations, called on the FDA to ban the use of contingent electric shock devices to modify the behavior of children and adults with disabilities. On April 24th, 2014, the FDA Medical Devices Advisory Committee held a panel on Neurological Devices, which found that the harms of these devices outweighed their potential benefits and created an unreasonable and substantial risk of injury. Although the FDA is authorized to ban medical devices that it determines pose an unreasonable risk of harm to consumers, it has not yet acted on the panel’s recommendation. Currently, only one institution in the United States, the Judge Rotenberg Center (JRC) of Canton, Massachusetts, uses contingent electric shock devices. However, one organization is too many. These shock devices often cause skin burns and long-term trauma to the victims of this “therapy.” At the JRC, patients find themselves wired to these devices against their will, not knowing when they will next be shocked. Unlike any other medical device on the market today, the sole purpose of these devices is to cause pain and fear in the recipients of the shocks. As a result, the United Nations has classified them as torture devices. A new group emerges in the space between “Antivax Twitter” and “Conservative Twitter”—we call it “vaccine choice” Twitter. The tweeters are the same individuals who have long been active in the autism-vaccine #cdcwhistleblower network. And originally, much of the content shared in #sb277 focused on the same anti-vax pseudoscience underlying #cdcwhistleblower. However, as bad science and conspiracies repeatedly lost in legislative votes, anti-vaxxers updated their marketing: They are now “pro-SAFE vaccine” parental rights advocates. Instructions to the group now focus on hammering home traditionally conservative “parental choice” and “health freedom” messaging rather than tweeting about autism and toxins. The other finding from observing anti-vax network graphs is that despite the vast majority vaccinating—national vaccination rates remain above 90 percent—there is no offsetting pro-vaccine Twitter machine; most parents simply vaccinate and move on with their lives. People don’t organize in groups around everyday life-saving measures; there is no pro-seatbelt activist community on Twitter. The recent emergence, lack of central coordination, and weak connections seen among pro-vaccine Twitter users, who often use the hashtag #vaccineswork, means that the pro-vax message (in green) is not amplified to the same degree. Jeremy B. White reports at The Sacramento Bee that a state legislator from Fresno spoke to a rally against a California vaccine mandate and likened the measure to internment camps. Senate Bill 277 would make vaccination a condition of enrolling in private and public schools, which opponents have castigated for depriving children of an education. That argument temporarily derailed the bill in the Senate Education Committee and was featured prominently in Tuesday’s rally. Later in his speech, Patterson said that he “thought we apologized for internment camps,” an apparent reference to the separation and confinement of Japanese-Americans during World War II. SB 277, which mandates vaccination for public and private school children, is set for debate in the State Assembly’s Health Committee Tuesday at 1:30 p.m. The largest-ever multinational study of parental age and autism risk found increased autism rates among the children of teen moms and among children whose parents have relatively large gaps between their ages. The study also confirmed that older parents are at higher risk of having children with autism. The analysis included more than 5.7 million children in five countries. The study, funded by Autism Speaks, appears online today in the journal Molecular Psychiatry. The higher risk associated with fathers over 50 is consistent with the idea that genetic mutations in sperm increase with a man’s age and that these mutations can contribute to the development of autism. By contrast, the risk factors associated with a mother’s age remain unexplained, as do those associated with a wide gap between a mother and father’s age. Sen. Ervin Yen, R-Oklahoma City, a cardiac anesthesiologist, plans to file legislation next year that would remove the religious and philosophical exemption options. Yen wrote the legislation after a measles outbreak that started at Disneyland in California in December. As of Feb. 11, a total of 125 measles cases with rash had been confirmed in U.S. residents connected to the outbreak, according to the Centers for Disease Control and Prevention. Yen said he anticipates some lawmakers will argue that the government should not tell people what to do, but in the realm of vaccines, it’s a matter of public safety. “This is not telling people they have to vaccinate their kids — it’s telling them they need to vaccinate their kids if they go to public, private or parochial schools,” Yen said. Yen said he was concerned that, in Oklahoma, the number of children whose parents are choosing to exempt their children has continued to rise. Although it remains a small number, Oklahoma has seen an increased number of parents choosing the personal exemption. In 2012, researchers at the Kennedy Krieger Institute, along with the Interactive Autism Network, helped spearhead the nation’s largest online autism research initiative. Their findings were staggering: 35 percent of respondents said their autistic children attempted to wander at least once a week. Another 29 percent said their children attempted to wander multiple times a day. Overall, half of all children on the autistic spectrum “bolt” around age 4 – up to eight times as often as their unaffected siblings – and they’re most often drawn to roadways or water. A 2008 study by Danish researchers found that the mortality rate among people on the autism spectrum was about twice that of the general population. In one of the most famous cases of bolting, 14-year-old Avonte Oquendo left school in Queens, New York, and was captured on security cameras. But searchers failed to track his path to the East River, where his body was found three months later. It was devastating news for his stepbrother, Daniel, who searched alongside hundreds of volunteers. In 1944, the United State Supreme Court ruled that insurance was a form of interstate commerce and therefore subject to federal regulation. 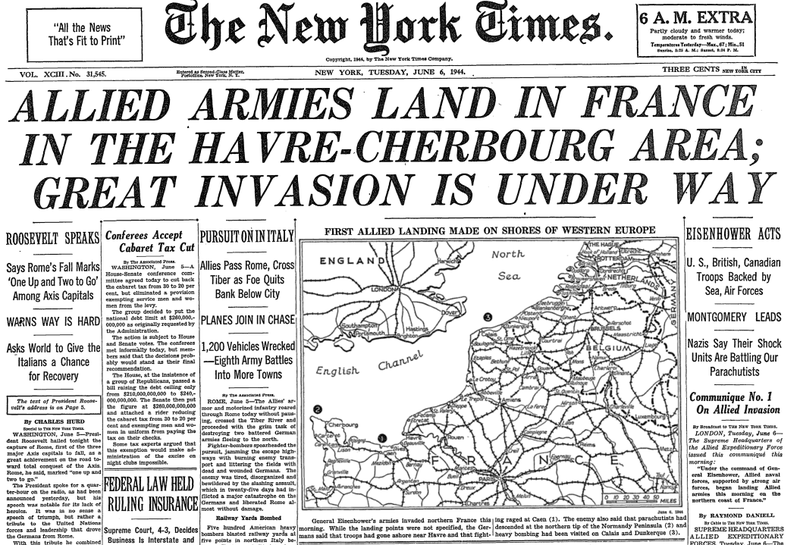 [i] The general public did not give much thought to the decision, since it appeared in the newspapers on the morning of June 6, also known as D-Day. Insurance companies did pay attention. They worried that the federal government could now use antitrust law to ban anti-competitive practices that had enriched them. They found allies in state officials, who feared that the ruling might jeopardize their ability to tax insurance. Accordingly, the National Association of Insurance Commissioners drafted a bill to exempt insurance from most federal regulation. [ii] Senators Pat McCarran (D-Nevada) and Homer Ferguson (R-Michigan) sponsored the bill, and an amended version – the McCarran-Ferguson Act – became law in 1945. [i] United States v. South-Eastern Underwriters, 322 U.S. 533 (1944). Online: https://supreme.justia.com/cases/federal/us/322/533/case.html. [ii] Erin K. Powrie, “`Too Big to Fail’ Is Too Big: Why the McCarran-Ferguson Exemption to Federal Antitrust Enforcement of Insurance Is Past Its Prime,” Rutgers Law Review 63 (Fall 2010): 359-388, at 367-368. Online: http://pegasus.rutgers.edu/~review/vol63n1/Powrie_EIC.pdf. See below. The story about the case is in the lower left -- and was probably the least-noticed front page story in the paper's history. Today, the Consumer Financial Protection Bureau (CFPB) is announcing the launch of the Reach Outcomes. Achieve Dreams. Succeed. (ROADS) to Financial Independence initiative, which is aimed at improving the financial well-being and economic security of individuals with disabilities. The initiative, which is piloting with local partners in six communities across the country, will integrate financial counseling with employment, independent living, and other support services that are being provided to individuals with disabilities.